Hypertension represents one of the main risk factors for vascular diseases. Genetic susceptibility may influence the rate of its development and the associated vascular remodeling. To explore markers of hypertension-related morbidity, we have used surface-enhanced laser desorption/ionization time-of-flight (SELDI-TOF) mass spectrometry to study changes in proteins released by the aorta of two rat strains with different susceptibilities to hypertension. 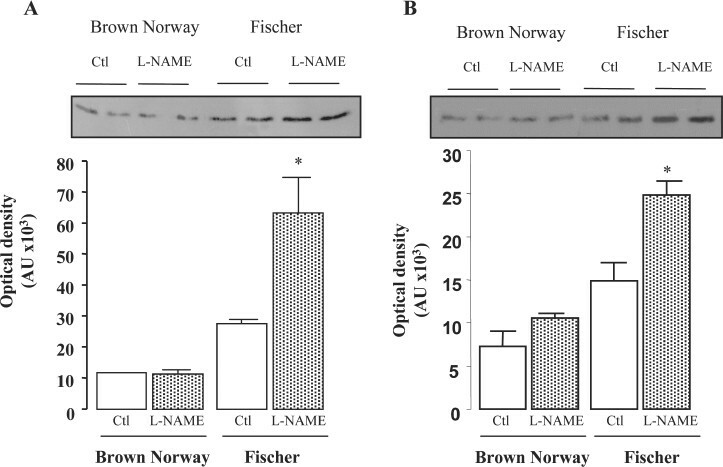 Fischer and Brown Norway (BN) rats were divided into a control group and a group receiving low-dose N(Q)-nitro-L-arginine methyl ester (L-NAME), a hypertensive drug, interfering with endothelial function. In spite of a significant elevation of blood pressure in both strains in response to L-NAME, BN rats exhibited a lower vascular remodeling in response to hypertension. 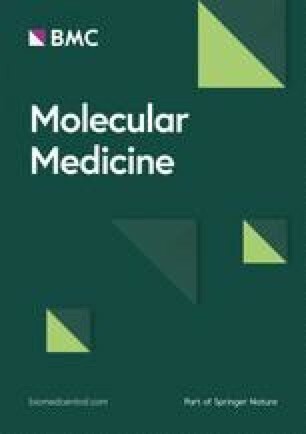 Proteomic analysis of secreted aortic proteins by SELDI-TOF MS allowed detection of four mass-to-charge ratio (m/z) peaks whose corresponding proteins were identified as ubiquitin, smooth muscle (SM) 22α, thymosin β4, and C-terminal fragment of filamin A, differentially secreted in Fischer rats in response to L-NAME. We have confirmed a strain-dependent difference in susceptibility to L-NAME-induced hypertension between BN and Fischer rats. The greater susceptibility of Fischer rats is associated with aortic wall hypertrophic remodeling, reflected by increased aortic secretion of four identified biomarkers. Similar variations in one of them, SM22α, also were observed in plasma, suggesting that this marker could be used to assess vascular damage induced by hypertension. Hypertension is a well-recognized risk factor for vascular diseases. Although there is no need for biomarkers to assess blood pressure, markers of vascular remodeling in response to high blood pressure would be of interest to evaluate arterial damage before the onset of clinical complications. Chronic blockade of nitric oxide (NO) production by administration of L-NAME is a well-established model of hypertension in rats, in which animals develop an intensive molecular and cellular response in the arterial wall leading to a significantly reduced survival rate (1,2). To explore new potential markers of the arterial wall response to L-NAME-induced hypertension, we used SELDI-TOF mass spectrometry technology, a differential proteomic approach allowing assessment of the differences in abundance of various proteins between different experimental and biological conditions (3, 4, 5). In a previous, unpublished study, we showed that survival rates of Brown Norway (BN) and Fischer rat strains differ significantly after L-NAME administration. BN survival was 80% after 90 d, whereas all Fischer rats had died by this time. In the present study, we thus selected these two rat strains with different susceptibilities to L-NAME-induced hypertension for identifying new potential biomarkers of hypertension and endothelial dysfunction-induced arterial wall remodeling. We also used a second model of hypertension (renovascular 2 kidney-1 clip [2K-1C] in which renin secretion is increased) (6) to validate the biomarkers identified as being specific for hypertensive pathology. We used the SELDI-TOF-MS approach to compare the profiles of proteins released from the arterial wall of hypertensive, compared with normotensive, rats. We report differential susceptibility of Fischer and BN rats to L-NAME administration and we show that hypertension and the pattern of secreted aortic proteins provides evidence of this differential susceptibility. We have detected by SELDI-TOF MS four proteins released by the aortas of hypertensive Fischer rats that could be linked to the pathological vascular remodeling observed in this model of hypertension. Losartan, an angiotensin II-type I receptor (AT1) antagonist, commonly used to treat hypertension in humans, inhibited the secretion of these four biomarkers. Fischer rats are particularly susceptible to L-NAME in terms of arterial remodeling (7). In contrast, BN rats are known to be resistant to hypertension (8,9). Therefore, we used these two strains, respectively sensitive and resistant to hypertension, for identifying new markers. Survival curves for L-NAME administration (50 mg/kg in drinking water; Sigma Chemicals Co., L’Isle d’Abeau, France) were determined for male rats of BN and Fischer 344 strains (n = 20 for each strain). Rats were aged 6 wks and weighed 150 g to 160 g at the beginning of L-NAME administration. Rats of both strains were randomly divided into two groups: (1) a control group (BN n = 20, Fischer n = 25); and (2) a group receiving L-NAME (BN n = 21, Fischer n = 26) at the dose of 50 mg/kg per d for 30 d in the drinking water (1). Another group of Fischer rats received both L-NAME and losartan (25 mg/kg, 30 d; MSD-Chibret laboratory, Paris, France; n = 10). In this study, we have also used the renovascular 2K-1C model (n = 10, in the Fischer strain only) (6). 2K-1C hypertension was induced by partial occlusion of the left renal artery by a clip (internal diameter 0.2 mm) while the right renal artery was untouched. Control rats were also subjected to surgery (sham-operated). All experimental procedures were performed in accordance with European Community Standards on the care and use of laboratory animals (Ministère de L’Agriculture, France, authorization 75–214), and conform to NIH Guidelines. Systolic blood pressure (SBP) was measured once a wk by the tail-cuff method and body weight was recorded. After 4 wks, the rats were deeply anesthetized by pentobarbital injection and blood was sampled in citrated tubes. The heart was removed and weighed for the calculation of heart-to-body weight ratio. The aortas were excised rapidly from the subclavian to the renal arteries, cleaned of adherent fat, rinsed in cold Hank’s balanced salt solution, and weighed. Aortas were then cut into small rings (about 3 mm in height) and incubated in 750 µL of protein-free culture medium (RPMI, 1% Hepes, 1% Penicillin, Streptomycin, Amphotericin [PSA]) for 24 h at 37° C (5% CO2). At the end of the incubation period, the medium containing the secreted proteins (conditioned medium) was centrifuged at 14,000 g (10 min, 4° C), and the supernatant was stored at @-20° C. Protein concentration was determined by the Bradford method. Concentrations of plasminogen activator inhibitor-1 (PAI-1), a plasma marker of hypertension (10), were determined in conditioned medium and in plasma using the Zymutest Rat PAI-1 Antigen assay from Hyphen BioMed (Neuville sur Oise, France) (11). Profiling of conditioned media was performed on a limited number of samples (untreated Fischer and BN rats, and Fischer and BN rats having received L-NAME, n = 4 for each group) using ProteinChip arrays (Ciphergen Biosystems, Fremont, CA, USA) with various chromatographic binding conditions: CM10 (cationic exchange) arrays in 100 mmol/L ammonium acetate pH 4, 5, and 6; Q10 (anionic exchange) arrays in 100 mmol/L Tris-HCl, pH 7, 8, and 9; IMAC30 (immobilized metal affinity chromatography) arrays loaded with Zn2+, Ni2+, or Cu2+ in 500 mmol/L NaCl, 100 mmol/L NaH2PO4/Na2HPO4 pH 7; and H50 (hydrophobic surface) arrays in 150 mmol/L NaCl, 0.1% trifluoroacetic acid containing 5%, 10%, or 15% acetonitrile. The samples were diluted in corresponding binding buffer with 100 µLof total incubation volume containing 75 µL of binding buffer. After 1 h of incubation with gentle shaking, the ProteinChip arrays were washed with the appropriate binding buffer. Finally, arrays were washed with water and allowed to air dry before adding the matrix, consisting of a saturated solution of sinapinic acid (Ciphergen Biosystems) in 50% v/v acetonitrile and 0.5% v/v trifluoroacetic acid. The m/z values of proteins retained on each chromatographic surface were determined from time-offlight measurement using a ProteinChip Reader (PBS II, Ciphergen Biosystems). Data were collected by averaging 180 laser shots for each sample, with laser intensity and sensitivity optimized for each type of ProteinChip array. The most discriminating conditions (CM10 array, pH 4, and IMAC30-Zn2+) were used for validation using a larger number of samples (Controls: BN n = 19, Fischer n = 19; L-NAME: BN n = 19, Fischer n = 20; Fischer L-NAME + Losartan: n = 10, Fischer 2K-1C: n = 10). 1.7 mL of Fischer L-NAME-conditioned media was diluted with 6 mL of 50 mmol/L Tris-HCl, pH 9 and loaded by gravity onto a 0.15 mL Q Ceramic HyperD F column (Pall Corporation, East Hills, NY, USA) equilibrated with 50 mmol/L Tris-HCl, pH 9. The loaded and flow-through fractions were analyzed by SELDI-TOF MS using CM10 arrays. All four selected biomarkers were found in the flow-through. The flow-through fraction was adjusted to a final concentration of 10% acetonitrile/0.5% TFA and bound to 50 µL of RPC Poly-Bio beads (Ciphergen Biosystems) for 30 min at room temperature. The bead suspension was centrifuged for 1 min at 1950g and the supernatant was removed by aspiration. Bound proteins were eluted successively with 0.4 mL of 10%, 20%, 30%, 40%, and 50% acetonitrile in 0.1% TFA. 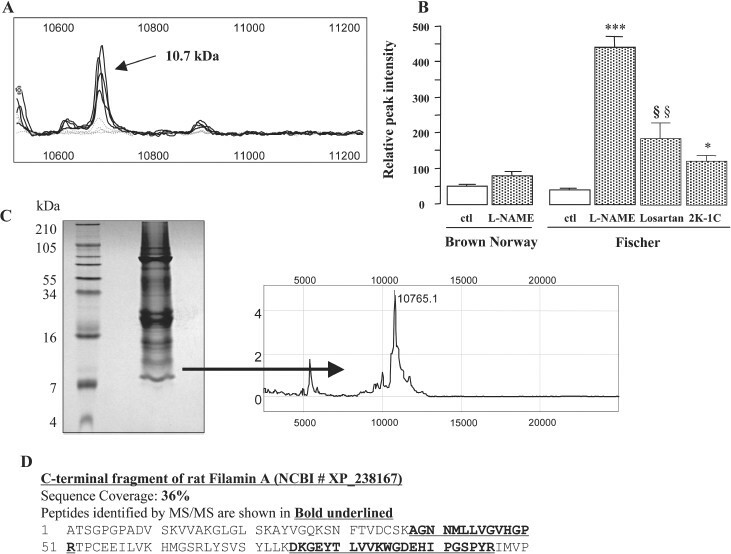 Proteins in the eluted fractions were detected by profiling 1 µL of each fraction on NP20 arrays. The fractions were vacuum-dried, redissolved in 20 µL of loading buffer and loaded on SDS polyacrylamide gels. Coomassie-stained bands were excised from the polyacrylamide gel with Pasteur pipettes. One quarter of bands were washed with 200 µL of 50% methanol/10% acetic acid for 30 min, dehydrated with 100 µL of acetonitrile for 15 min and extracted with 12 µL of 50% formic acid/25% acetonitrile/15% isopropanol/10% water by incubating for 2 h at room temperature with vigorous shaking. Extracts (1 µL) were profiled on NP20 arrays to confirm that the m/z value of the selected protein band matched the m/z value of the biomarker. Three quarters of bands were in-gel digested with 10 ng/ µL bovine modified Trypsin (Roche Applied Science, Meylan, France) in 50 mmol/L ammonium bicarbonate (pH 8) overnight at 37°C. Digest aliquots (1 µL) were spotted on a NP20 ProteinChip array. 1 µL of saturated CHCA in 50% acetonitrile/0.5% TFA was immediately applied to the spot and the two solutions were mixed by pipetting. Single MS and MS/MS spectra for the tryptic digest were acquired on the Q-TOF2 (Micromass, Manchester, UK) tandem mass spectrometer equipped with a Ciphergen PCI-1000 ProteinChip Interface. First, spectra were collected for a region of m/z from 800 to 3000 in single MS mode. After reviewing the spectra, individual ions were selected for collision-induced dissociation (CID) analysis. Argon was used as a collision gas and collision energy was approximately 50 eV/kDa. The CID spectra were submitted to the database-mining tool Mascot (Matrix Science, London, UK; https://doi.org/www.matrixscience.com) for identification. Before western Blotting of plasma, albumin was removed from each sample by using the Enchant Albumin Depletion kit (PALL Life Science, MI, USA). The conditioned culture medium and albumin-depleted plasma of Fischer and BN rats were separated by SDS-PAGE and transferred to a nitrocellulose membrane (Hybond ECL, Amersham, Little Chalfont, Buckinghamshire, UK). The membrane was incubated with primary antibody (mouse monoclonal anti-ubiquitin [Santa Cruz Biotechnology, Santa Cruz, CA, USA]: 0.8 µg/mL goat polyclonal anti-SM22α 1:1000 Abcam, Paris, France) and appropriate secondary antibodies conjugated to horseradish peroxidase were used. Detection was performed by using ECL reagents (Amersham, Little Chalfont, Buckinghamshire, UK). Immunohistochemistry was performed on frozen sections (5 µm). Anti-ubiquitin (1 µg/mL, Santa Cruz Biotechnology) antibody was used as primary antibody, biotinylated anti-mouse IgG affinity-purified rat adsorbed (Vector Labs, Burlingame, CA, USA) was used as secondary antibody and peroxidase Vector ABC kit for detection. Naïve mouse IgG 1 (Dakocytomation, Glostrup, Denmark) was used as a negative control to assess non-specific staining. Results are expressed as means ± SEM. Comparisons between multiple groups were performed by one- or two-way analysis of variance (ANOVA) as appropriate, followed by the Bonferroni/Dunn test. The survival distribution was estimated by the Kaplan-Meier method and the survival curves were compared by the log rank test. Linear regression curves and correlation coefficients were obtained by the least-squares method. Statistics were performed using Statview software. We hypothesized that the susceptibility to L-NAME-induced hypertension and mortality could vary between rat strains. The blood pressure and survival rates were established. As illustrated in Figure 1, BN survival was 80% after 90 d, whereas all Fischer rats had died by this time (P < 0.0001). 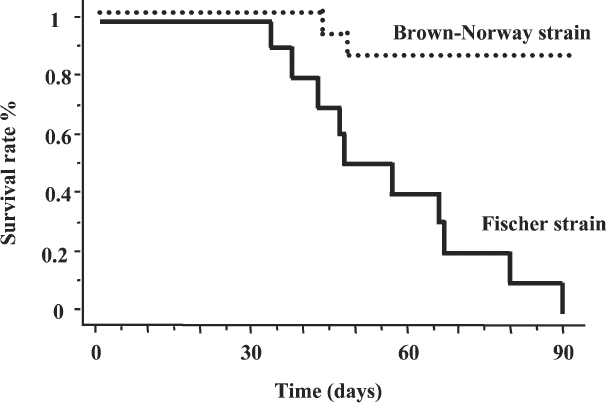 Survival rates of Brown Norway and Fischer strains in response to L-NAME administration. The figure represents the survival curves of Fischer and Brown Norway rats (n = 20 for each group) in response to L-NAME administration (50 mg/kg). The survival rate is significantly (P < 0.0001) reduced in the Fischer strain. Chronic blockade of NO synthase by L-NAME in the two strains of rats resulted in the development of hypertension (Table 1, P < 0.0001). SBP increased more in Fischer than in BN rats (P < 0.0001) in response to chronic L-NAME administration. In Fischer rats, the L-NAME-induced hypertension was partially prevented by losartan (P < 0.0001 compared with L-NAME and P < 0.0001 compared with control). Clipping of the left renal artery in Fischer rats also induced a significant increase in blood pressure after one month (P < 0.0001 compared with untreated rats). a The strain dependence of the effect of L-NAME intoxication was evaluated by a two way ANOVA. bP < 0.05 compared with control rats, one way ANOVA. cP < 0.05 compared with L-NAME rats, one way ANOVA. dP < 0.01 compared with control rats, one way ANOVA. As shown in the Table 1, after 4 wks of L-NAME administration, body weight (BW) was significantly decreased in both BN and Fischer groups. In accordance with our previous publications, heart weight (HW) was not significantly (two-way ANOVA) modified by L-NAME administration in Fischer rats (see Table 1) (12), whereas renovascular hypertension was associated with a significant increase in heart weight. However, we observed a significant increase in the HW/BW ratio in the two rat strains. This effect could be related to the decreased body weight in the L-NAME-treated rats. As presented in Table 1, the wet weight of the descending thoracic aorta was significantly higher in Fischer than in BN rats (71.1 ± 2.6 mg compared with 63.4 ± 1.8 mg) and a marked increase was observed after L-NAME administration in Fischer rats (+ 37.7%). This effect of L-NAME on aortic mass was consistent with an increase in aortic media thickness previously described in this model, as in other models of hypertension. Furthermore, renovascular hypertension promoted a significant increase in aortic wet weight (+ 25.1%, P < 0.001 compared with untreated rats). The treatment of Fischer L-NAME rats with losartan significantly inhibited vascular hypertrophy (P < 0.0001 compared with L-NAME rats). The quantity of proteins released in the conditioned medium after 24 h of incubation was determined (see Table 1). We observed a powerful interaction between strain and the effect of L-NAME administration (P < 0.0001). Secreted proteins increased in Fischer rats in response to L-NAME (P < 0.0001) but not in BN rats. 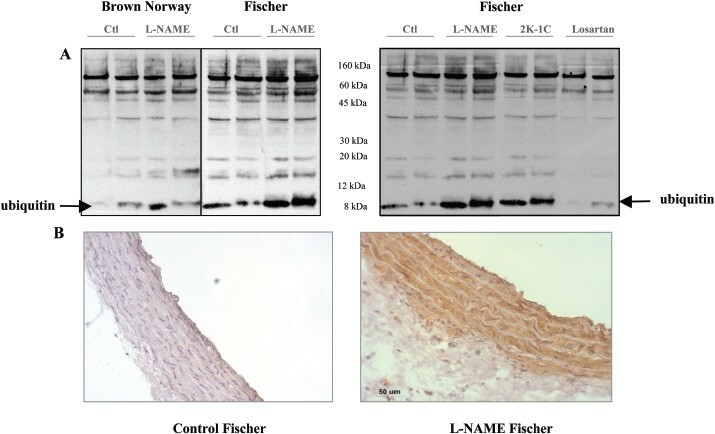 The treatment of Fischer rats with losartan significantly decreased the protein secretion induced by L-NAME (P < 0.0001 compared with Fischer L-NAME rats) whereas the concentration of secreted proteins was higher in 2K-1C Fischer rats compared with control Fischer rats (P = 0.01). Because PAI-1 is recognized as a prognostic biomarker in human (10) and experimental (11) hypertension, we assessed its levels in aortic conditioned media and in plasma, to validate our model. As shown in Table 1, secretion of PAI-1 into the culture medium was not different between BN and Fischer rats in basal conditions, but was increased significantly in Fischer rats having received L-NAME (P < 0.0001). In the Fischer L-NAME-losartan group, the secretion of PAI-1 in conditioned medium was similar to that of the control group (P = 0.001 compared with L-NAME rats). Renovascular hypertension was associated with a non-significant increase in PAI-1 concentration in the conditioned medium. As a consequence of the PAI-1 secretion by the aorta, PAI-1 levels were also increased in plasma (see Table 1) of rats having received L-NAME (P = 0.002). The treatment of L-NAME Fischer rats with losartan significantly decreased plasma PAI-1 concentration (P < 0.0001 compared with Fischer L-NAME rats). The clipping of the left renal artery was also associated with a significant increase in PAI-1 antigen levels in plasma (P < 0.001 compared with untreated rats). Profiling was performed on aortic secretomes from eight BN and eight Fischer rats, four controls, four having received L-NAME in each group. The volume of samples loaded in the bioprocessor was normalized to aortic wet weight: that is, as all aortas were incubated in the same volume of culture medium, a proportionately smaller volume of conditioned medium was loaded for hypertrophic aortas relative to normal aortas. The most discriminating conditions (CM10, pH 4, and IMAC30- Zn2+) were chosen for validation on a large number of samples with additional experimental conditions (2K-1C and L-NAME losartan Fischer rats). The spectra obtained by SELDI-TOF MS for 93 secretomes (46 BN and 47 Fischer controls or hypertensive) were analyzed by Biomarker Wizard software (Ciphergen Biosystems). Figure 2 shows representative spectra obtained on CM10 arrays pH 4 for two rats of each group and all identified biomarkers are described in Table 2. The identification of four of these proteins is reported here. Representative spectra and identity of biomarkers. Representative of full mass range spectra obtained for conditioned media of two representative rats per group, analyzed on cationic exchange chromatography (CM10 ProteinChip arrays pH 4) are presented here. Description of all identified biomarkers. aThis table summarizes for all identified m/z values both observed and calculated. bThe P value determined between the different groups of rats (F: Fischer Control, FLN: Fischer L-NAME, BN: Brown Norway Control, BNLN: Brown Norway L-NAME). cGroups which have been compared to determine the P value. The secretion of the 22.4 kDa biomarker in the culture medium was largely increased (P < 0.0001) in Fischer rats having received L-NAME, and losartan treatment prevented this release by 37% (Figure 3A,3B). In the BN strain, no effect of L-NAME was observed on the secretion of the 22.4 kDa biomarker. It is noteworthy that in basal conditions (normotensive rats) the release of this biomarker was significantly different between Fischer and BN strains (P = 0.0385). These results suggest that the 22.4 kDa protein could reflect a difference in genetic susceptibility to hypertension. Renovascular hypertension also promoted this release. The secretion of this protein was significantly correlated with SBP in the Fischer strain (r = 0.631, P = 0.0001) and no correlation was observed in the BN strain (Table 3). The 22.4 kDa biomarker was gel-purified (Figure 3C) as described in Materials and Methods. The most abundant ions were analyzed by MS/MS and all of them were identified as fragments of rat SM22α (Smooth muscle protein 22-α or Transgelin, Swiss-Prot P31232) (Table 4). The calculated molecular mass of SM22α (22,471.66 Da) matched with sufficient accuracy the average experimentally observed value of 22,460 Da. 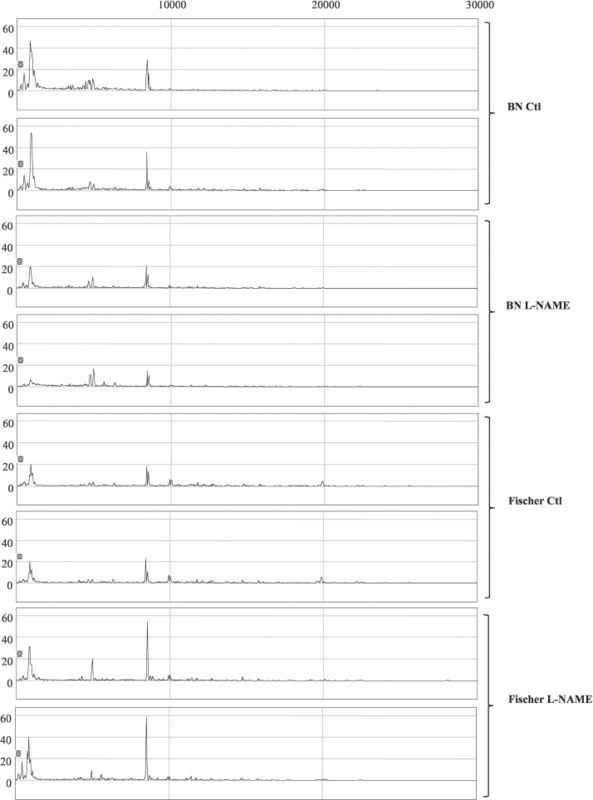 (A) Representative spectra of Fischer rats (control: n = 4; L-NAME: n = 4) obtained on CM10 ProteinChip Arrays. (B) Relative intensity of 22.4 kDa peak in each group of rats. The secretion of this marker was only observed in the hypertensive Fischer rats, and losartan treatment significantly decreased its release into the culture medium. *P < 0.05 compared with control, one-way ANOVA. **P < 0.01. ***P < 0.001 compared with control rats. §P < 0.05 compared with L-NAME, one-way ANOVA. (C) Coomassie-stained 12% Bis-Tris gel after purification of the secreted 22.4 kDa protein by anion exchange and reverse phase chromatography (marker of interest ≈ 22 kDa is shown by an arrow) and reprofiling of the gel-extracted protein using SELDI-TOF MS. (D) Amino acid sequence of SM22 a, 5 peptides identified by tandem mass spectrometry are underlined (see Table 4). Correlation between the systolic blood pressure measured at the end of experiment and the peak intensity of each marker. aLinear regression curves and correlation coefficients were obtained by the least-squares method. Identification of peptides by MS/MS. aIon score is -10*Log(P), where P is probability that the match is a random event. bIndividual ion scores higher than a number displayed in the column indicate identity or extensive homology (P < 0.05). As shown in Figure 4 (A,B), the release of the 8.5 kDa protein was strain-dependent (two-way ANOVA, P = 0.0001) and an increase was observed with L-NAME administration in Fischer rats (P < 0.0001). After one month of treatment with losartan, the release of the 8.5 kDa protein was decreased significantly in the Fischer L-NAME rats (relative intensities: 2807 ± 315 compared with 4952 ± b348 in Fischer L-NAME, P < 0.0001). The secretion of the 8.5 kDa biomarker was not specific to L-NAME-induced hypertension, because a similar effect was observed with renovascular hypertension (2692 ± 105, P = 0.03 compared with control Fischer rats). As shown in Table 3, we observed a positive correlation between SBP and the secretion of the 8.5 kDa protein (r = 0.627, P < 0.0001) in Fischer rats, whereas no correlation was observed in BN rats, although L-NAME administration induced a significant increase of blood pressure in this strain. After gel purification, the protein band corresponding to the 8:5 kDa (Figure 3C) was in-gel digested and the resulting fragments were analyzed using Q-TOF2 in MS mode. Six unique ions were analyzed by MS/MS and all of them were identified as fragments of rat ubiquitin (Swiss-Prot P62989) (see Table 4). Calculated MW of ubiquitin 8564.84 Da matched the average experimentally observed value of 8564 Da. Secretion of ubiquitin by hypertensive rats. (A) Representative spectra of Fischer rats (control: n = 4; L-NAME n = 4) obtained on CM10 ProteinChip arrays. (B) Relative intensity of the 8.5 kDa peak in each group of rats. The secretion of this marker was influenced by both strain and L-NAME with an interaction. An increase was observed in reno-vascular rats while losartan diminished the intensity in Fischer L-NAME rats. *P < 0.05 compared with control, one-way ANOVA. ***P < 0.001 compared with control rats. §P < 0.05 compared with L-NAME, one-way ANOVA. §§§P < 0.001 compared with L-NAME rats. (C) Coomassie-stained 16% Tricine gel after purification by anion exchange and reverse phase chromatography (marker of interest ≈ 8.5kDa is shown by arrow) and the spectrum obtained on NP20 array for the band of interest. (D) Amino acid sequence of ubiquitin. Six peptides identified by tandem mass spectrometry are underlined (see Table 4). The release of the 10.7 kDa protein (Figure 5A,5B) was strain dependent (P < 0.0001) and a strong increase was observed after L-NAME administration in the Fischer strain (P < 0.0001). Reno-vascular hypertension also promoted this release. Treatment of L-NAME Fischer rats with losartan decreased the release of this biomarker by 70%. The release of this protein was strongly correlated (see Table 3) with SBP in the Fischer strain (r = 0.855, P < 0.0001), whereas no significant correlation was observed in the BN strain (r = 0.324, NS). After gel purification, a protein band corresponding to the 10.7 kDa protein (Figure 5C) was in-gel digested and analyzed using Q-TOF2 in MS mode. Three unique ions (see Table 4) were analyzed by MS/MS and identified as fragments of rat Filamin A (NCBI XP_238167). Filamin A is a very large protein of 2,647 amino acids, however all three identified tryptic fragments were located at the very C-terminal region of the protein. Therefore, it was concluded that the 10.7 kDa protein corresponds to the C-terminal fragment of Filamin A (calculated MW 10,703.41 Da, average experimentally observed MW 10,704 Da). Secretion of the C-terminal fragment of filamin A. (A) Representative spectra of Fischer rats (control: n = 4; L-NAME n = 4) obtained on IMAC30 ProteinChip arrays. (B) Relative intensity of the 10.7 kDa peak in each group of rats. The release of this marker was influenced by both strain and L-NAME and there was a significant interaction. An increase was observed in renovascular rats while losartan diminished the intensity in Fischer L-NAME rats. *P < 0.05 compared with control, one-way ANOVA. ***P < 0.001 compared with control rats. §§P < 0.01 compared with L-NAME, one-way ANOVA. (C) Coomassiestained 16% Tricine gel after purification by anion exchange and reverse phase chromatography (marker of interest ≈ 10.7 kDa is shown by arrow) and the spectrum obtained on NP20 array for the band of interest. (D) This protein was digested with trypsin and analyzed by tandem mass spectrometry. The amino acid sequence was obtained for three peptides (bold underlined, see Table 4). The release of the 4.9 kDa protein by the aorta was influenced by both strain (P < 0.001) and L-NAME administration (P < 0.0001) with a strong interaction (P < 0.0001) showing that L-NAME induced more release of this biomarker in Fischer rats than in BN rats (Figure 6). One month of losartan treatment completely inhibited the secretion of this polypeptide (P < 0.0001). We observed a strong positive correlation between the release of the 4.9 kDa protein and the SBP only in the Fischer strain (r = 0.613, P < 0.0001) and no correlation was observed in the BN strain (see Table 3). The 4.9 kDa protein was found in RPC fraction 20% acetonitrile. Therefore, the fraction was vacuum dried and directly insolution digested with endoproteinase Asp-N (Roche Applied Science). The digest was analyzed using Q-TOF2 in MS mode and a major ion with m/z of 3,529.2 was detected (see Table 4). This ion was analyzed by MS/MS and identified as Asp-N fragment of rat thymosin β4 (SwissProt P62329). Secretion of thymosin β4 by hypertensive rats. (A) Representative spectra of Fischer rats (control: n = 4; L-NAME n = 4) obtained on CM10 ProteinChip arrays. (B) Relative intensity of the 4.9 kDa peak in each group of rats. The release of this biomarker was influenced by both strain and L-NAME, and there was a significant interaction. An increase was observed in renovascular rats, while losartan diminished the intensity in Fischer L-NAME rats. *P < 0.05 compared with control, one-way ANOVA. ***P < 0.001 compared with control rats. §§§P < 0.001 compared with L-NAME, one-way ANOVA. (C) This bio-marker was analyzed by tandem mass spectrometry after chromatographic purification (reverse phase column) followed by a direct AspN digestion (without separation on gel). The amino acid sequence of the peptide analyzed by MS/MS is presented in Table 3. To confirm the increase in the secretion of ubiquitin in Fischer L-NAME rats, we performed Western blotting on the secreted proteins and immunohistochemistry on frozen sections of aorta. Figure 7A shows an increase in the ubiquitinylated proteins in the conditioned medium from Fischer L-NAME rats by comparison with the untreated Fischer rats. A similar result was observed in the conditioned medium of aorta from 2K-1C rats. No differences were observed between the control and the L-NAME group in the BN strain. The enhanced secretion of ubiquitin in response to L-NAME administration in the Fischer strain was associated with an increase in ubiquitin or ubiquitinylated proteins stored within the smooth muscle cells, as demonstrated by immunohistochemistry (Figure 7B). Western blot also was performed on albumin-depleted plasma from each group, but ubiquitin was not detectable (data not shown). Detection of ubiquitin in conditioned medium and aortic wall. A) Representative blots of secreted proteins from two rats of each group. Proteins (loading normalized to aortic wet weight) were electrophoresed on an 18% acrylamide gel and transferred onto nitrocellulose membranes. Membranes then were probed with a monoclonal antibody to ubiquitin (1:250). B) Ubiquitin immunostaining in aortas of L-NAME and control Fischer rats. The identification of SM22α in conditioned media also was confirmed by Western blotting. In accordance with the analysis of the mass spectra, we observed a strong release by Fischer L-NAME rat aortas and no effect of L-NAME administration in the BN strain (Figure 8A). We have also performed Western blotting on plasma samples. L-NAME administration induced a significant increase of plasma SM22α of Fischer L-NAME rats but only a tendency to increase in the BN rats that received L-NAME (Figure 8B). Detection of SM22α in conditioned medium and in plasma. 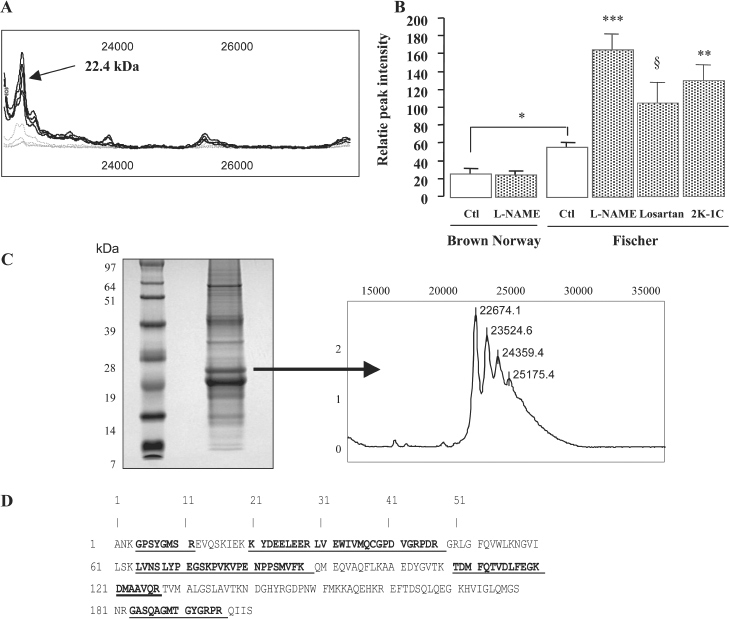 (A) Representative blots of secreted proteins from two rats of each group. Proteins (loading standardized by aortic wet weight) were electrophoresed on a 12.5% acrylamide gel and transferred onto nitrocellulose membranes. Membranes were then probed with a monoclonal antibody to SM22 α (1:1,000). (B) Representative blots of albumin-depleted plasma (15 µL, n = 2 for each group). Western blots were performed using the same conditions as those used for the conditioned medium. *P < 0.05 compared with control rats. Due to the fact that no commercially available antibody against thymosin β4 could be used in rats, we have not been able to confirm either the presence of thymosin β4 in arterial wall or its release in conditioned medium or plasma by Western blotting. 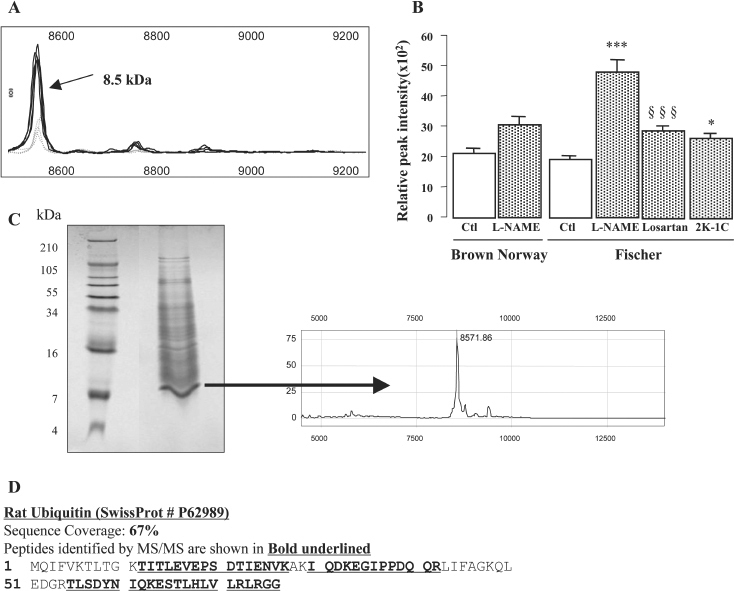 Furthermore, the 10.7 kDa protein corresponding to the Ct fragment of filamin A could not be detected by Western blot (data not shown) by using commercially available antibodies. The aim of this study was to screen and identify proteins secreted by the arterial wall as potential biomarkers of susceptibility to hypertension-linked arterial wall remodeling. For this purpose we have used two rat strains with different susceptibilities to L-NAME-induced hypertension, and the SELDI-TOF MS proteomic approach to obtain protein patterns that distinguish various experimental conditions (that is, disease compared with disease-free) with high sensitivity (13,14). We chose the BN and the Fischer strains, which showed contrasting susceptibilities characterized by markedly different levels of blood pressure and survival rates in response to L-NAME administration. Our results show that BN rats are less susceptible than Fischer rats to hypertension thus induced by the chronic blockade of NO production. The fact that BN rats are more resistant to L-NAME administration has been confirmed by a recent study which demonstrated that transfer of chromosome 1 from the BN rat to the Fawn-Hooded Hypertensive rat reduced the severity of L-NAME-induced hypertension and renal disease (8). As a consequence of the hypertrophic vascular remodeling in response to hypertension induced by chronic inhibition of NO production, we observed, for the first time, that hypertrophy in Fischer L-NAME rats not only is associated with protein accumulation in the arterial wall, but also with an increase in protein secretion. Previous studies have demonstrated that L-NAME administration is associated with an enhanced aortic protein synthesis (15, 16, 17) which could be due to the increase in gene expression observed after one month of L-NAME administration (7). The fact that a similar, albeit less powerful, effect was obtained in renovascular hypertension suggests that the increase in pressure-dependent stress on the aortic wall is the main determinant of the increase in the arterial protein synthesis, storage, and release. The partial prevention by losartan suggests that the renin-angiotensin system is, at least in part, involved in the functional and morphological response of the arterial wall (2). In the present study, losartan reduced blood pressure significantly, but not completely. This was sufficient to inhibit the pathological vascular remodeling and associated release of PAI-1 and biomarkers discovered by our differential proteomic analysis. We suggest that a threshold of pressure must be reached to initiate the vascular remodeling. We sought to analyze the proteins released by the aortic segments because they could reflect the pathological vascular remodeling occurring during hypertension and provide insight into the strain-based differences observed in the response to L-NAME. As previously described, incubation of vascular tissue ex vivo for 24 h in serum-free culture medium is compatible with proteomic analysis and provides valuable information on the vessel wall secretome by comparing various experimental conditions (18, 19, 20). The secretion of the four proteins found to be increased between controls and L-NAME-treated Fischer rats (ubiquitin, SM22α, thymosin β4 and the C-terminal fragment of filamin A) also was increased by renovascular hypertension. Losartan (an AT-1 receptor antagonist) inhibited their secretion in L-NAME-induced hypertension. It has been demonstrated previously that blockade of NO production by L-NAME could enhance the intracellular signaling pathways activated by the interaction of angiotensin II with the AT-1 receptor (2). In our study, the beneficial effects of losartan could be explained, at least in part, by the prevention of this activation. The presence of ubiquitin (8.5 kDa) in the conditioned medium of aortas from Fischer L-NAME rats may be a marker of an enhanced ubiquitinylation in the arterial wall and particularly in smooth muscle cells, as shown by immunohisto-chemistry. The ubiquitin-dependent proteasome system is considered to be a major pathway of intracellular protein degradation maintaining cellular homeostasis (21). The function of ubiquitin is to target proteins to the proteasome for degradation. The ubiquitin-dependent proteasome degradation system is involved in a number of pathophysiological processes, including proliferative steps, inflammation, and apoptosis mechanisms that are fundamental in the development of cardiovascular diseases (22). Accumulation of ubiquitin in L-NAME and renovascular hypertensive Fischer rats provides evidence of an increased protein turnover in the hypertrophied smooth muscle cells of hypertensive rats. It has been reported that the ubiquitin-proteasome system could promote smooth muscle cell proliferation and inflammation in the context of restenosis (23). This concept can be extended to hypertension characterized by an inflammatory state (24). In addition to the role of ubiquitin in protein degradation, it also has been suggested that polyubiquitin may be a marker of the contractile phenotype of smooth muscle cells (25). The authors demonstrated that ubiquitin expression correlated with the expression of contractile proteins such as αSM actin, calponin and a second smooth musclespecific protein, SM22α. They concluded that ubiquitin could be involved in the contractile function of smooth muscle cells associated with a differentiated phenotype. Indeed, we have observed in our study that the greater elevation of blood pressure in Fischer rats is associated with an increase in the secretion of SM22α in aortic-conditioned medium and in plasma. SM22α or transgelin is a 22-kDa cytoskeletal protein which is expressed abundantly and exclusively in visceral and vascular smooth muscle cells (26). The function of SM22α remains obscure, although its actin-binding properties and its role in smooth muscle cell contractility and differentiation have been documented (27,28). It has been shown previously that stretching of vascular smooth muscle cells, which can be considered as an in vitro model of hypertension, is associated with an increase in expression of smooth muscle-specific proteins linked to the contractile system (29). Interestingly, more SM22α is released by normotensive Fischer than by normotensive BN aortas and this secretion is increased further in Fischer rats having received L-NAME. The same trend was observed in plasma, suggesting that this marker is linked not only to hypertension, but could be associated with the genetic susceptibility to the response of L-NAME administration. Thymosin β4 is the most abundant member of the β-thymosin family, a family of 5 kDa peptides (30). Although it has numerous functions, the most prominent involves sequestration of G-actin monomers and the subsequent effects on actin-cytoskeletal organization necessary for cell motility; it also is implicated in organogenesis and other cellular events. Thymosin β4 can be detected in the extracellular space and in the plasma where its concentration increases under inflammatory conditions and prethrombotic states. Boncela et al. (31) and other (32) have observed that thymosin β4 strongly stimulates endothelial cells to express and release plasminogen activator inhibitor type 1 (PAI-1). Filamin A is a 280 kDa cytoskeletal protein which cross-links actin and could be involved in translating chemical and mechanical signals into an appropriate cell response (shape, motility, synthesis function) (33). It has been shown previously that the content of filamin A in the arterial wall could be modulated by mechanical forces (34). In our model of L-NAME-induced hypertension, ubiquitin, SM22α, thymosin β4, and filamin A all could play a role in the maintenance of contractile functions in VSMCs. In spite of a switch toward a hypertrophic phenotype, smooth muscle cells of hypertensive Fischer rats exhibited an increase in contractile protein mRNA, as we reported previously (two-to four-fold increase in myosin heavy and light chain-related proteins) (7) and in contractile function (2). Inhibition of the ubiquitin-proteasome system in a model of restenosis in vivo led to a reduction in intimal hyperplasia (23), suggesting that ubiquitin could participate in proliferation and inflammation. This is in accordance with our results showing an increased proinflammatory and procoagulant state in L-NAME hypertensive rat VSMCs (11,24,35) and previous studies (36) reporting polyploidy phenotypes in hypertension. In conclusion, we have observed a strain-dependent difference in susceptibility to L-NAME-induced hypertension and vascular remodeling between BN and Fischer rats. The greater susceptibility of Fischer rats is associated with a significant increase in blood pressure and aortic wall hypertrophic remodeling, reflected by increased protein secretion. Within this increased aortic wall protein secretome, we identified, by using SELDI-TOF MS and tandem MS technology, four original biomarkers directly linked to L-NAME-induced hypertension: ubiquitin, SM22α (transgelin), thymosin β4, and the Ct fragment of filamin A. These four proteins are linked to mechanical stress, contractile protein turnover, and oxidative stress, and provide new biomarkers linking hypertensioninduced arterial wall remodeling to morbidity-mortality rate in animals. Extension of these data to humans requires further exploration. SM22α is of special interest because its levels are significantly higher in basal conditions (before hypertension) in the most susceptible strain, and are further increased in plasma under hypertensive conditions. It could represent a marker of susceptibility to hypertension-induced arterial wall remodeling. Sandrine Delbosc was supported by a grant from MSD-Chibret Laboratory and the French Society of Hypertension. This work was supported by the Leducq Foundation and the manuscript was edited by Mary Osborne-Pellegrin.